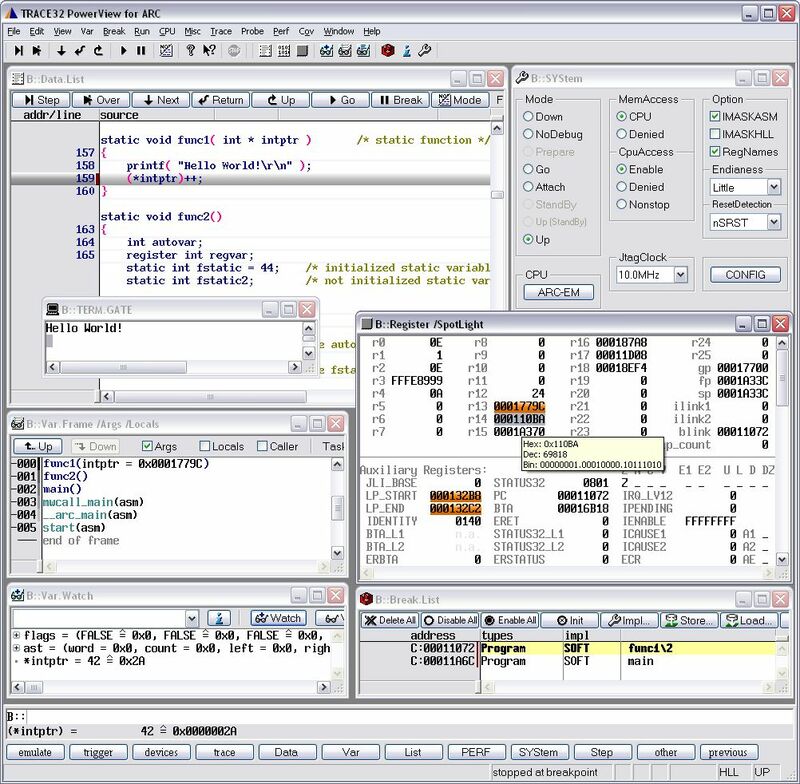 TRACE32 is the state of the art debugger from Lauterbach. It comes with the universal user interface PowerView running on your PC, MAC or Workstation and the smart debug probe PowerDebug which connects via USB or Ethernet. The PowerDebug connects via a DebugCable to you target chip via the classic 5-Pin JTAG (IEEE 1149.1) or via the new 2-pin mode IEEE 1149.7 (often called cJTAG). PowerDebug is a smart debug probe, which means that the debug driver software runs inside the probe to react very fast on your CPU. The debugger supports all the powerful common TRACE32 features, such as on-chip breakpoints, unlimited software breakpoints, online memory access, snooping the program counter, RTOS support and multicore debugging. 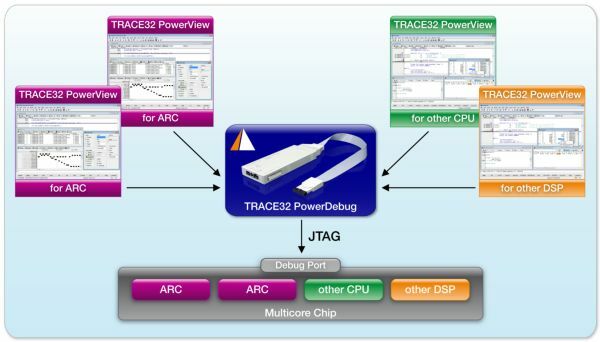 Multicore debugging might be the strongest feature of TRACE32: If you have a SoC containing several ARC DesignWare® cores or even other CPUs or DSPs you can debug all your cores together with only one PowerDebug probel via a single JTAG port. Thanks to the universal user interface PowerView, Lauterbach provides the same look-and-feel for all processors. This gives you the chance to switch to DesignWare® ARC processors without further training for using the debugger. PowerView runs on Windows, Linux, Mac and Solaris for both 32-bit and 64-bit machines. PowerView is fully scriptable, which means that any debugging sequence can be reproduced easily a thousand times. Print messages from your target application directly to your TRACE32 GUI with a simple "printf"